Yesterday had been a long tiring day, so we took our time this morning, no sunrise. After leaving the park and deciding to have a leisurely morning we heard that sunrise from Dead Horse Point was really spectacular. We left our campsite at 8:30 and drove to The Islands in the Sky District of Canyonlands National Park. This is where the Green River flows into the Colorado River. By 9:30 the temperature was up to 79 degrees. The Grand Overlook would be a great place to be at either sunrise or sunset. 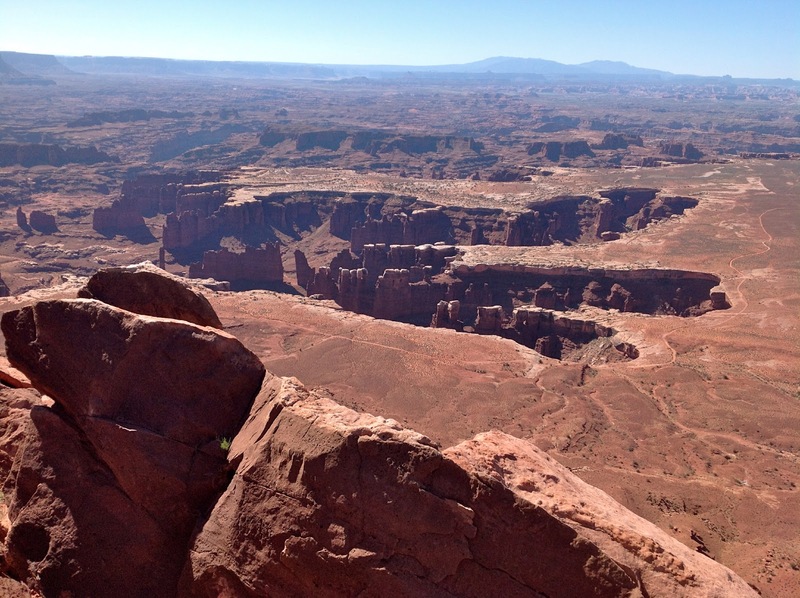 It took us about 30 minutes to get to the far reaches of where you can drive at Canyonlands National Park from Dead Horse Point. It's much cooler up on this mesa than it is down in the flatlands at Moab. 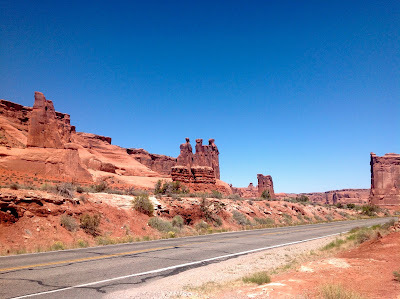 You can tell by the clear sky that the day was heating up as we drove into The Arches National Park. I had wanted to camp here tonight, but was unable to secure reservations. 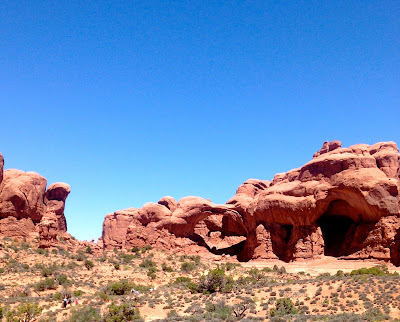 By the time we drove in and hiked to see those that were not too far from the road the heat was getting to us. We had wanted to see Landscape Arch, but the hike was 2 miles and the temperature was 95. So at 12:30 we left the river and drove down to the river to have lunch. 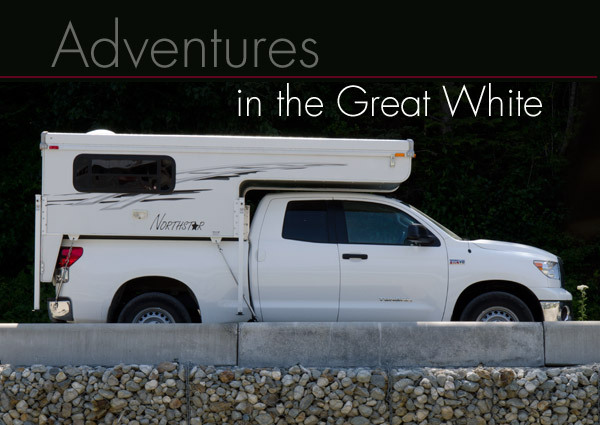 After driving along the Colorado River on Scenic Highway for awhile we decided we'd best start heading towards Monticello and decide where we were going to stay for the night. After we had passed the turn off for the short drive to The Needles District of Canyonlands Mark decided we should drive out there. We took a road out of Monticello that went up through the forest of aspen, where the temperature was 79,and them back down to Canyonlands. The ranger at the other section of Canyonlands National Park had told us that the campground in this section of the park was very popular and that we would have to arrive early in the day to get a site. As we were driving through the forest we spotted 2 forestry campgrounds that were empty that we could drive back to for a campsite for the night if necessary. The closer to the campground at The Needles, the hotter it became.We were pleasantly surprised to find campsites available for the night at Squaw Creek Campground, so we nabbed a good one. Since the temperature was 99 degrees at 6:30, we hopped back in the car and went to explore. 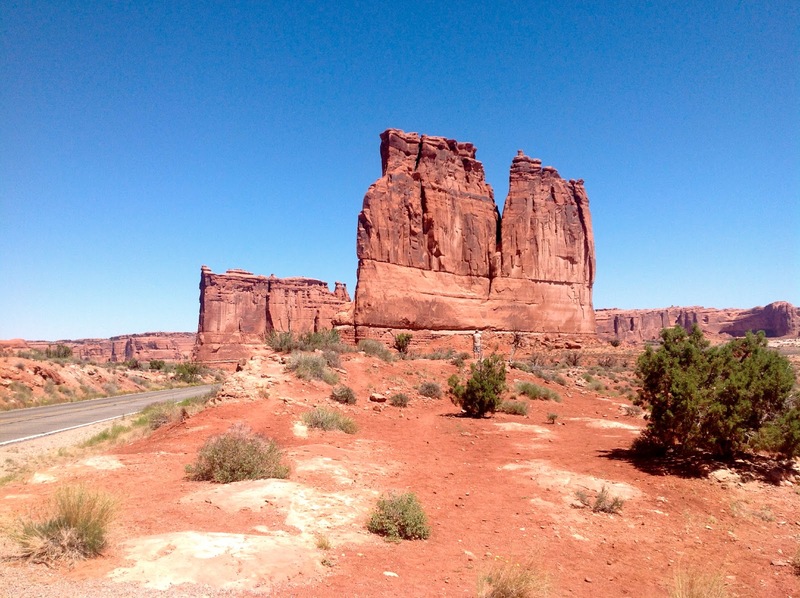 After checking in at the visitor center we drove down a jeep trail that was labeled "Colorado River Overlook". The trail started out sandy, no problem, after about 5 miles we began hitting a lot of rocks. The first bad place, we had no choice, we had to keep going, our wheels were already on the stair step rocks and we'd missed the turnaround. After a few more challenging rocky places we decided it was late and we'd had enough, so we turned around and drove back to camp. No pictures of this intense time. On the road back I noticed I had a jeep trail guide. It said this trail had "large stair steps the last 1 1/2 miles". We probably were to about the last 1/2 mile when we chickened our and turned around. Once we were back at the campsite Mark set up to catch a sunset photo and I headed over to the ranger program at the campfire less campfire. The ranger shared Native American Creation Stories.